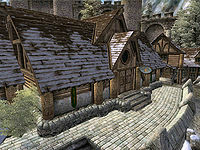 Bruma Mages Guild is found on the north end of the city, across from a row of residential homes. Bruma's Mages Guild does not specialize in any particular school of magic. 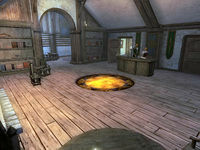 The building is divided into the Bruma Mages Guild and the Mages Guild Living Quarters. 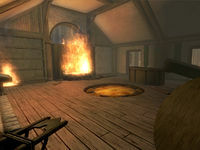 After A Plot Revealed, the Bruma Mages Guild is destroyed, and entering places the player character into a different cell. Entering the front door of the guild hall reveals an entrance with a desk opposite the door. Two scrolls sit on top of the desk - one Shield and one Starlight. Facing the door, the large bookshelf on the right holds a novice mortar and pestle and calcinator, along with several common books. Facing the desk, the large bookshelf on the left holds only common books, while the small bookshelf on the right holds a minotaur horn as well as minor clutter and common books. The locked display case next to the entrance contains copies of Tamrielic Lore and Varieties of Daedra. The open doorway next to this shelf leads to a small room with a table that holds a full set of novice apparatus, a respawning chest of drawers with clutter, and a staircase which leads down to one of two doors to the Living Quarters. The other open doorway in the main entrance room leads to a small room with a respawning chest of drawers with clothing, two respawning chests that hold clutter, and two sets of stairs - one leading down to one of two doors to the Living Quarters, and one leading up. The stairs leading up reveal Jeanne Frasoric's room. On her desk are three scrolls - one of Starlight, one Flare, and one Snowball - as well as a novice calcinator and a copy of Mystery of Talara, v 5. The desk itself contains clutter and, during the Recommendation quest, Jeanne's personal copy of Manual of Spellcraft. The cupboard contains clothing. The chest of drawers contains only clutter, and the bookshelf next to it holds clutter, common books, and a silver dagger. The double bed can only be used by Jeanne, and the chest next to it holds only clutter. All of the containers in this room respawn. In the main entrance room, there are two doors behind the desk. The door on the left opens on a small room where Selena Orania can often be found. The bookshelf against the right wall holds three potions - one Potion of Insight and two Potions of Healing - and three scrolls - one Snowball and two Starlights. On the counter are two empty soul gems - one petty and one lesser. On the shelves behind the counter are three alembics, two calcinators, three retorts, and three mortar and pestles. All of the items in this room belong to Selena. The other door leads into a small room with a cupboard, six barrels and two untied sacks. They all contain food. The two tied sacks holds clutter. The three sacks on the wall opposite the door do not respawn; however, every other container in the room does. After A Plot Revealed, the Bruma Mages Guild is destroyed, and entering the building puts the player character into a completely different cell, so any items in these containers will be permanently inaccessible. The living quarters can be accessed through either of two doors from the above main floor, which are on opposite ends of a hallway, which also has two doors on each side. The doors on the east side lead to two bedrooms. Upon entering the northeastern bedroom, J'skar's bed is on the right. Volanaro's bed is in the opposite corner. The chest of drawers contains clothing. The desk may contain a book and/or clutter, and on top of it sits a sample of bonemeal, a green stain cup cap, and a calcinator. On the bookshelf are two Potions of Antivenom, ogre's teeth, a pearl, a stinkhorn cap, a redwort flower, a sample of viper's bugloss leaves, and a sample of void salts. Both the chest and the desk in this room respawn. The door to the southeastern bedroom opens to reveal Selena Orania's bed on the left. The further bed on the same wall can be used by any Mages Guild member. J'skar can often be found in this room. The chest in the corner may contain clothing and/or clutter. The chest of drawers contains clothing and on top sits a handbill from the Jerall View Inn. The desk may contain a book and/or clutter, and on top sits the Illusion skill book The Wolf Queen, v 3 which belongs to J'skar, a calcinator, and a mortar and pestle. All of the containers in this room respawn. The south room on the west side of the hall is a dining room. On the large table in the middle of the room sit upper class dishes and food - two loaves of bread and three apples. The north room on the west side of the hall has two tables on the left wall with alchemical supplies. On the first are two mortar and pestles, a calcinator, and an alembic, as well as several plants - two clouded funnel caps, a steel-blue entoloma, and a green stain cup cap, all growing in a tray. There is also a piece of venison and a leek. On the second table are three retorts, an alembic, a calcinator, a mortar and pestle, and several harvested ingredients - a green stain cup cap, an emetic russula cap, a cinnabar polypore yellow cap, as well as a cheese wedge and a sample of glow dust. The barrel between the two tables and the one in the corner are both empty. The two cupboards on the wall opposite the door both contain food. The bookshelf contains common books and clutter and a silver dagger, and on the desk sit two potion recipes, one to restore health and one to cure disease, as well as a mortar and pestle. There may be a common book and/or clutter inside the desk. All of the containers in this room respawn. In the main entrance room, one of the large bookshelves is on fire, and has fallen across the left doorway, blocking it. Selena Orania's body is lying in front of the fire. The large bookshelf on this wall is empty, as is the display case. The table and chairs next to the front door are overturned, and both of the doors behind the desk have been blown out of their frames. The small bookshelf has fallen over onto the desk. Behind the desk, in the room on the left where Selena could be found, the few items left on the counter are burning. Only three mortar and pestles are left on the shelves behind the counter, and two empty soul gems - one lesser and one petty - are on the floor behind the counter. Through the other door behind the desk, the three sacks that did not respawn are burning, along with the two barrels in the west corner. The rest of the room is the same. In the main entrance room, through the unobstructed doorway, the bench in front of the table has been overturned. The items on the table have been scattered, some overturned and some fallen to the floor. Volanaro's body can be found on the stairs here. 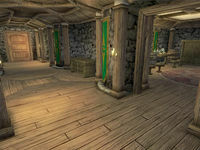 Through the doorway to the Living Quarters, the first door on the left is barricaded by a bookshelf on the other side. Inside, an unidentifiable, burning body lies on Volanaro's bed, and the rest of the room is empty. In the second bedroom, Selena Orania's bed has been knocked askew, and the chest is missing. There are no items on top of any of the surfaces. The rest of the room appears normal. On the other side of the hall, the alchemy room has a fire burning in the corner with the barrels. The first table is mostly undisturbed, with only a few ingredients missing - the alchemical apparatus and the sample of bonemeal are still in place. The second table has been overturned, and the items from it are missing, as are the items from the bookshelf and desk. In the second room on the west side of the hall, the dining table and all of the items that were on it are in a pile, burning in the center of the room. Through the door at the other end of the hall, the staircase up leads to the area blocked by the burning bookshelf in the main entrance room. With the exception of the chest near the banister, the containers here are still in the same places, and nothing is burning. Continuing up the stairs leads to Jeanne Frasoric's room, where Camilla Lollia can often be found. Jeanne's large desk is pushed up against a wall, while her body can be found at the foot of her bed. The only item of note left in the room is the silver dagger on the bottom shelf of the bookshelf. * Camilla Lollia appears during A Plot Revealed. 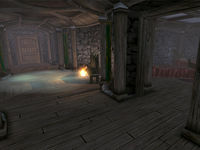 None of the beds are usable in the destroyed version of Bruma's Mages Guild. Bruma Recommendation: Find a missing mage to obtain a recommendation from Bruma. A Plot Revealed: Travel to Bruma and find out why the Mages Guild there has stopped correspondence. This page was last modified on 13 October 2018, at 09:43.